There was a time when rainbows and unicorns were the stuff of legend, relegated to the highest of high fantasy and the cheapest of female-targeted school supplies. Those were despair-filled days — days when the mere semblance of a smile was slapped from the lips of man, woman and child alike. Would we ever feel hope and warmth? The answer arrived on the back of a glorious white steed riding a wave of lightborn color. That answer was simply, "Always." Robot Unicorn Attack is more than just a silly game about van painting come to life. It's a monument to the age of mobile and browser-based gaming, the herald of a return to simpler times, where two buttons, one to jump and one to dash, almost seem excessive. 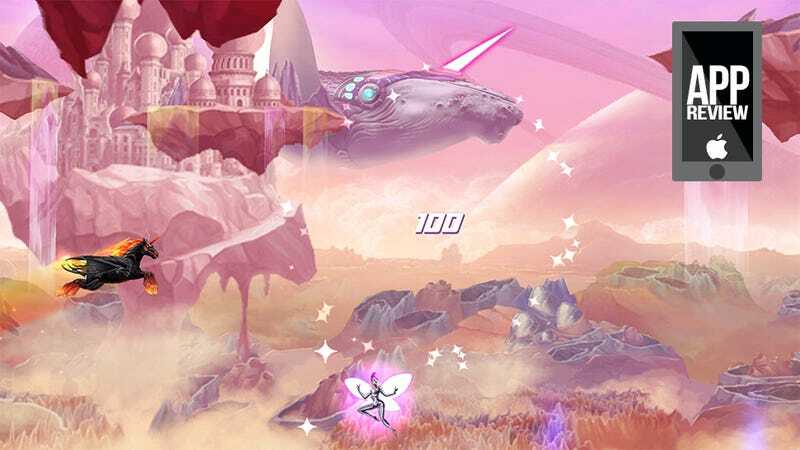 Long before the Temple Run-inspired endless runner boom (well, a year or so), Robot Unicorn Attack was driving players to distraction, carrying them across the clouds on the waves of Erasure's most mystical love song, cycling endlessly through the sky. Fairies were cavorted with. Stars were smashed. Decapitated metaphors for mankind's innocence exploded. It was near perfect. Other variations came, and they were good. There is the metal variant, powered by Blind Guardian's "Battlefield." A Facebook version rose up, adding competitive social features and power-ups to the recipe, allowing other players to join together in their magical journeys. The series slowly evolved, but never strayed far from the herd. When Adult Swim contacted me to tell me Robot Unicorn Attack 2 was coming out this week, I was excited at the prospect of new adventures, but worried the classic formula might be stretched beyond all recognition. Then I launched the game, and I was horrified. There was no Erasure. There was no Blind Guardian. There was only a fantasy instrumental. Making a Robot Unicorn Attack fan who lives 15 minutes away from the Adult Swim offices is not wise. Thankfully for all parties involved, I am also a lazy fan, so instead of filling my car with oily rags and kerosene, I sat down and played. And played. And played. I played until I reached level four, and the ability to purchase songs was unlocked. That's right — songs, plural. New players downloading the free app early tomorrow morning will be greeted by the following message. There was only one song I could imagine being more perfect for this game than "Always," and there it is: "Never-ending Story." I'm tingling just thinking about it. Dammit. I want to stop writing this and go play some more. Music confusion aside, the heart of the original Robot Unicorn Attack beats on in this Pik Pok-developed sequel. Magnificent beasts leap gracefully against a backdrop of a living progressive rock album cover. Dolphins frolic. Horned space whales sing wistful songs as they lumber across the sky. But this is no mere re-skinned clone. Robot Unicorn Attack 2 combines elements of the social and mobile games that came before it, sampling mechanics from popular endless running contemporaries along the way. The playfield is multi-leveled now, allowing jumping and falling experts alike to explore new territory. Furthermore, each of the game's two worlds (ice unlocks at level 15) change their layout every day, always offering a fresh experience. Oh yes, there are experience levels, gained by completing a series of personal, community and daily goals as you play. Earning levels unlocks new power-ups, enhanced social features and new components for crafting your own personal unicorn. See the wings? Oh yes, you can fly now, should you make it far enough. That makes you an alicorn, and also a princess. All of this, and I've not even touched on the social features. War has come to Robot Unicorn Attack, and players must pick a side. Each day the battle begins anew, a tug-of-war between light and dark, the side with the most stars smashed winning valuable points, good towards purchasing upgrades. It's no longer a simple flight of fantasy. It's a fight. Of fantasy. Yes. Though it gave me quite a scare at first, Robot Unicorn Attack 2 has proven a worthy successor to the title that first spread joy and laughter throughout a dead land. New features make it more of a game than ever before. So turn around. Tell me what you see in her face. The mirror of your dreams. Yes, yes, yes.